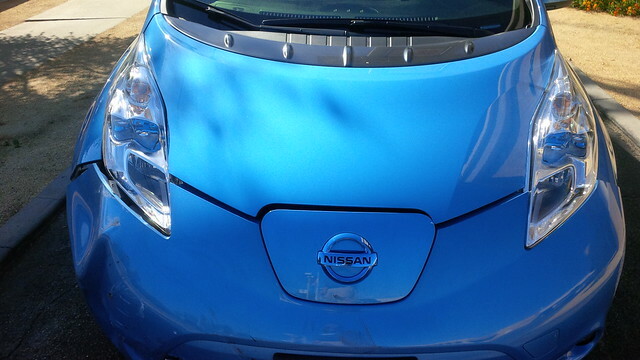 On Saturday, September 26th my mom was driving her little blue 2013 Nissan Leaf (OB-8) that she leased on July 2013. An SUV didn’t see her and decided to merge into her lane. The most important part of OB-8’s job was to keep her safe and it did just that. She was unhurt from the accident, she was sad for her little blue Leaf, but in good spirits at her getting through the accident physically unscathed. Longtime readers of the blog remember welcoming mom to the rEVolution. And like many EV drivers, once you go EV, it’s hard to go back. 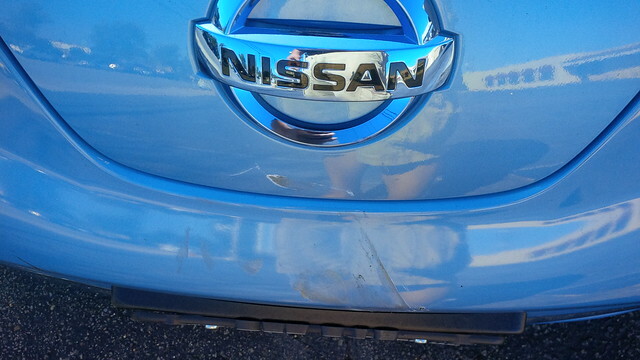 On initial review, The damage did not look that bad. The wheel and tire looked like goners, but looks like it could be repaired or replaced. 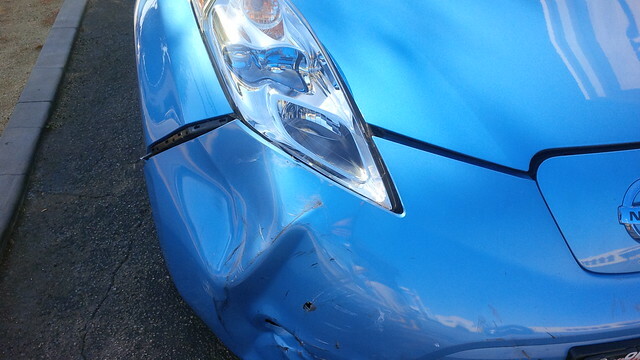 The passenger side looked relatively unscathed. 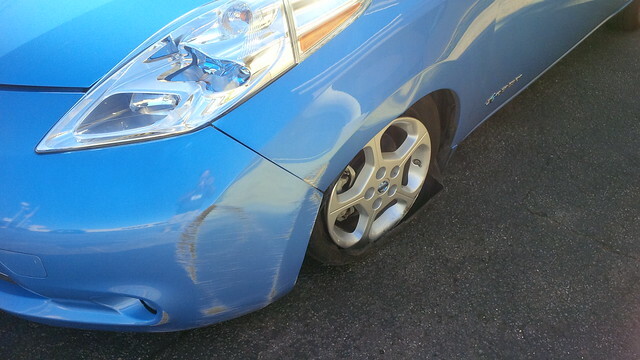 However, between the damage to the car and the depreciated value of the 2013 Leaf, the insurance company declared the car a total loss. More shots of the car from the passenger side. The charge port door was stuck. 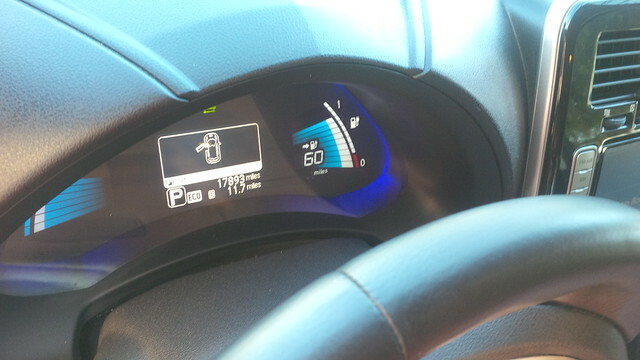 Close up of the charge port door. The battery is still in good condition, or at least it still kept its charge. 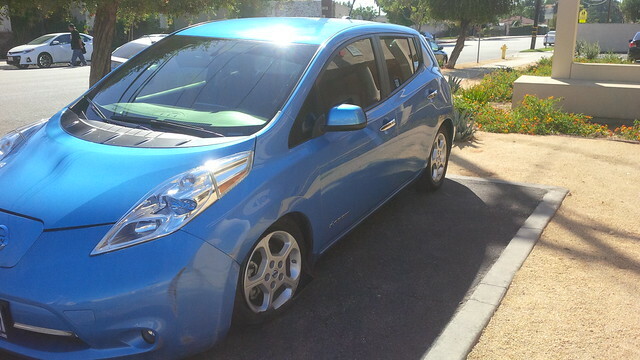 Thus, with 17,893 miles in a little over 2 years, we had to say goodbye to OB-8, Mom’s Ocean Blue 2013 Leaf. Mom leased OB-8 and the residual value on the statement was about $6,300 more than what the adjuster had valued the car for. We initially were wondering whether Nissan would allow us to apply the $5,000 price reductions that 2013 Leaf lessors were offered a few months ago as a totaled car is effectively bought out. 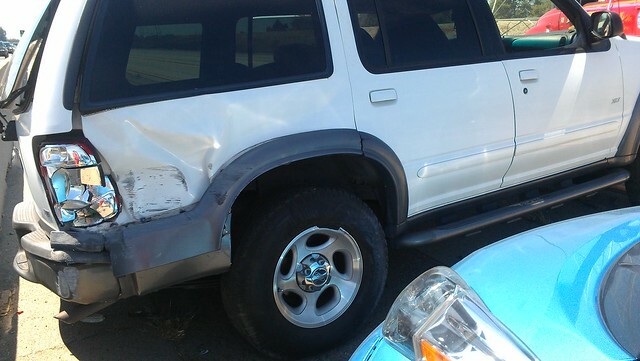 Luckily, Nissan had Gap Insurance on the car, so she just had to pay her deductible and was able to walk away from the car. Had she purchased the car and not purchased this insurance, she would have been liable for this shortfall on a loan. 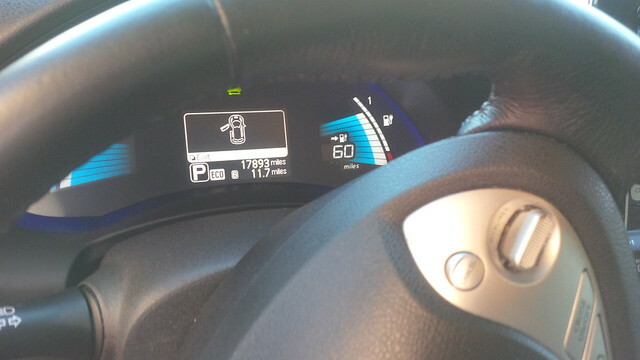 The 2016 Leaf with 6 kWh more in the SV and SL packages seem to be a no brainier, but there are definitely more options. Though mom originally wanted to be able to DC fast charge she only did one DCFC and that was when I trained her on using the CHAdeMO. So, what’s next? Stay tuned. We’re checking out alternates for her, too bad the Model 3 or Bolt EV isn’t out yet. However, it’s a good thing I started test driving new EV choices during National Drive Electric Week 2015, but that’s another post. I certainly didn’t look like a write-off! What a shame. So, are you going to buy back the car, strip out the battery and drive train and bolt them into a Aerial Atom? Or is that just me dreaming! The adjuster told my mom that there was significant damage to the subframe and the axle. 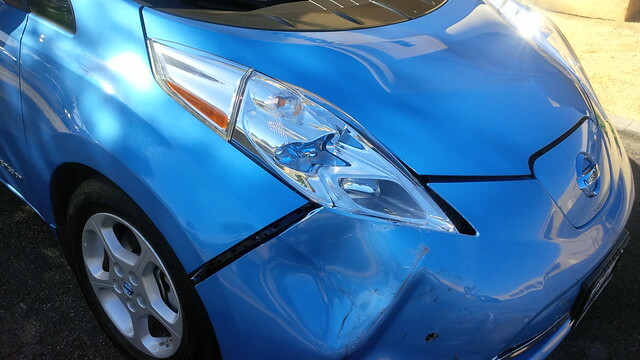 I believe that this coupled with the depreciation made her little blue Leaf a total loss. As for the drivetrain and battery… That’s you. I’m strictly a “let the experts” build us a car kind of guy. Though, if I win the lottery, I am calling Zelectric Motors and asking them to convert a classic VW Bug and make it an EV for us. Was there a repair estimate? I’d be interested in what they thought it would cost. I sent an email to find out if my mom ever got that information. I know that they had a list of 4 comparable vehicles which is how they came up with what the market value of her Leaf was at the time they totaled it. Got the answer. 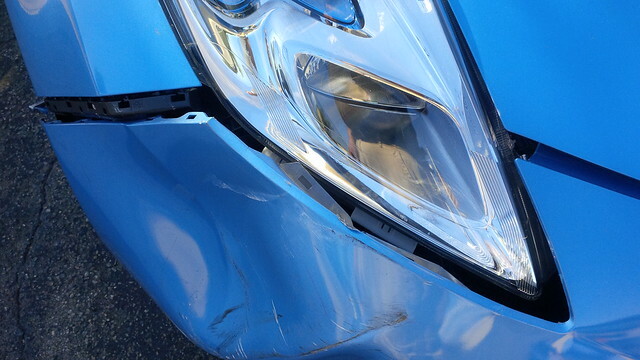 Though the repair was less than the value of the vehicle. The repair estimate was at 85% the value of the vehicle. The insurance company policy is to total any vehicle whose repair cost is 80% or greater than the market value of the vehicle being repaired. Thus, the car was declared a total loss. A Kia Soul EV would certainly be a step up for your Mom…something to consider in your quest. Thanks Joe. The Kia Soul EV rides high (like the i3) and after two decades of driving mini-vans, I think my mom would prefer to drive something in that seated position. Thank God for GAP insurance! I didn’t even realize I had it prior to my own LEAF crash. Curses to SUV drivers.They all seem to think they own the road. Yup… Same here. We usually buy our cars and skip the Gap, but it seems to be rolled into the lease programs of many (if not all) manufacturers. Its premium is rolled into the cost of the monthly payment for the lessee, I’m sure, but a good hedge against that residual value gap with market value for #EVs.